Biotechnology is the research-oriented science including a mixing of biology and technology. The study of living organisms like plants, animals and microbes and its application to human welfare is known as biotechnology. The study includes structures, physiological and biochemical functions and various beneficial and harmful aspects of living organisms. Biotechnology can deliver the next wave of technological change that can be radical and even more pervasive than that brought about by IT. Employment generation, intellectual wealth creation, expanding entrepreneurial opportunities, augmenting industrial growth are a few of the compelling factors that warrant a focused approach for this sector. Biotechnology and Biosciences are one of the most research - intensive industries in the world. Biotechnology is perceived as a revolution throughout the world. If you have a strong inclination for unraveling the mysteries of nature, then biotech sector is the one you should go for. There are enormous opportunities for a career in Biotechnology. The enormity of biological resources makes a case for raising a whole cache of highly trained professionals for inventorisation, characterization and documentation. The areas offering opportunities include Medical microbiology, modern health care delivery systems, Bio-medical engineering and Biomaterials, diagnostics in health care, industrial biotech, environmental protection, biodiversity conservation, food processing, bioprospecting marine bioproducts, production of biological and other biotechnological products, entrepreneurship development, teaching and training in biotechnology and biosciences. 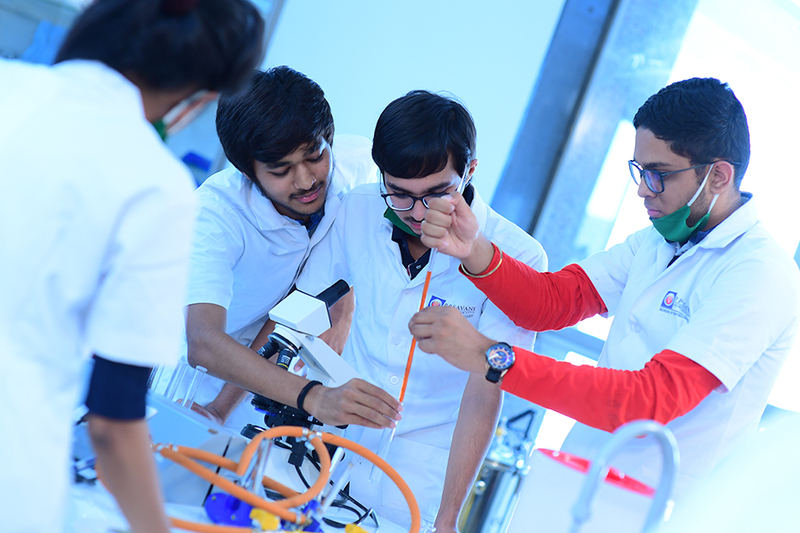 On completion of a course in this area candidates shall acquire knowledge in process and products of living organisms, biomedical instrumentation, computational techniques and immunotechnology. They apply this knowledge in healthcare, industry, agriculture and in environmental protection. There is a great scope for career in Biotechnology in India as well as abroad. Career in Biotechnology offers various employment opportunities in research,marketing and production. Spacious laboratories with best infrastructure and equipments. A separate well stocked departmental library with reading room. Internet access for the students with all the software’s required for the curriculum. Guest lectures by experts, seminars, exhibitions, quiz competitions etc. for overall development of the students. Research training in various reputed institutes and industries. Excellent curriculum including Theory, Practicals and Research project. The astounding progress of science in the last hundred ways is just the beginning. In an age of disruptive thinking the frontiers of scientific knowledge are being constantly challenged creating new pathways in medicine, information technology, pure sciences – and as many of them overlap each other, new ideas, inventions and discoveries emerge. Age old theories are being questioned everyday and an inconvenient truth reveals itself everyday. It is perhaps the finest era to pursue a career in the sciences.